Hi there, hello! Hope you're all having a lovely day. 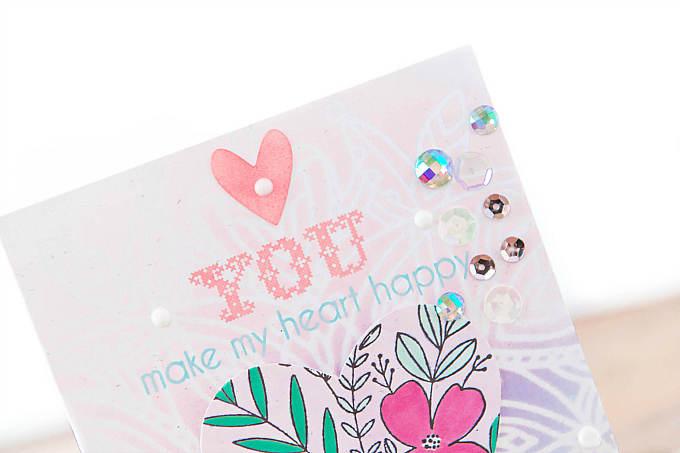 I wanted to pop in quickly to share a card I whipped up after some playful stenciling and coloring. I made this card a while ago, and then completely forgot about it. Does this happen to you? I have a heap of other cards to share with the newly released Pinkfresh goodies, and before I get to sharing those, I thought I'd put this little number up. 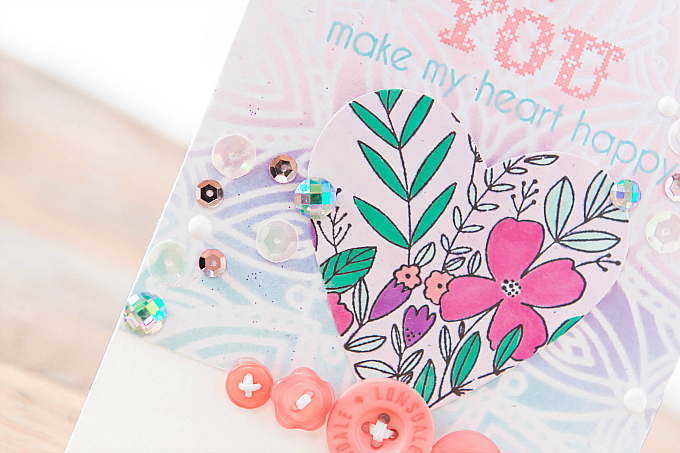 The base of this card was created with the beautiful and delicate Simon Says Stamp Heart Mandala stencil, using Distress Oxide colors of Spun Sugar, Shaded Lilac and Tumbled Glass. It's a very delicate stencil, so I had a bit of a challenging time trying to get all the detail inked up, but it was so worth the patience! The design is even more beautiful IRL. At the top of the card, I stamped the first part of my sentiment using stamps from a retired PTI stamp set, as well as Altenew's Botanical You stamp set. For the beautiful heart, I used Pinkfresh Studio's Fleur 1 stamp set (I really, really hope you're not tired of me using this set, but it might just be my favorite floral ever ;) I used my Copics to color in some sweet colors, and although you can't see it very well here, I also colored the background PTI heart with a soft pink instead of leaving it white. At the bottom, I added some stitched buttons, and the remainder of my sentiment, stamped with Altenew's Stunning Cosmos stamp, and a sprinkle of sparkle. 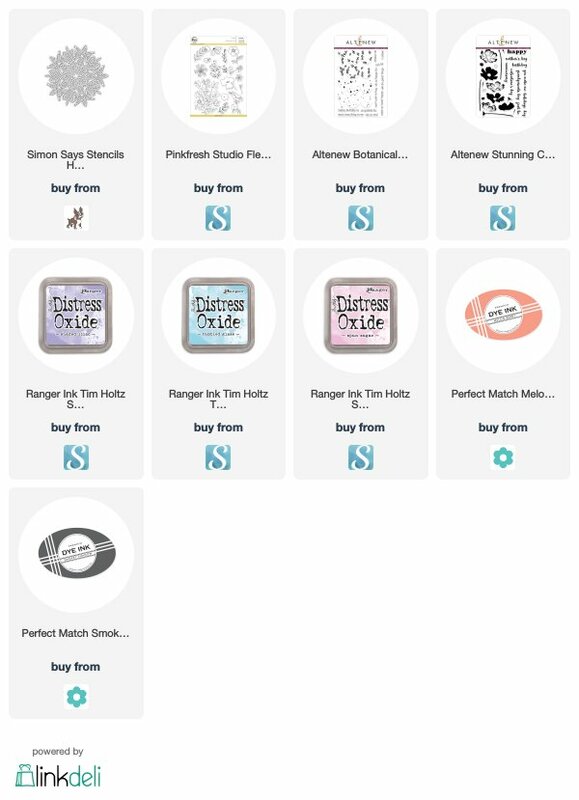 I hope you've enjoyed today's mash-up of patterns! Do you think it works or do you prefer these two colorful designs on their own? I would love to see your stenciled or colored floral designs. Share them with me, and all of us by tagging your photos on Instagram! Very pretty heart design and love the use of the buttons. Thank you so much, sweet Diane! Sending you the biggest of crafty hugs! 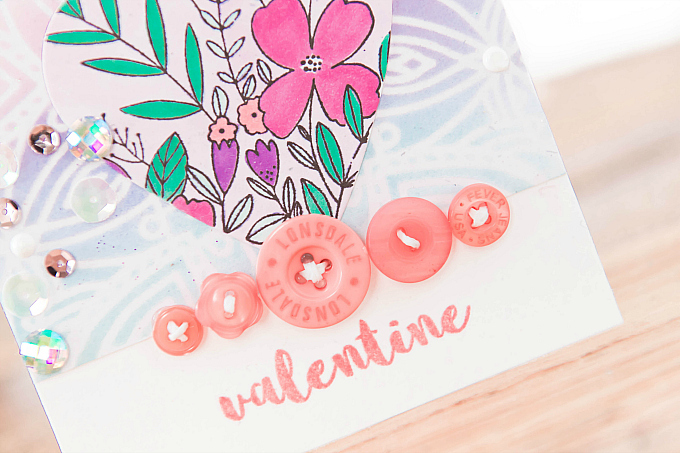 From your soft stenciling to that row of pretty little buttons, this is layered in loveliness! It's beautiful. 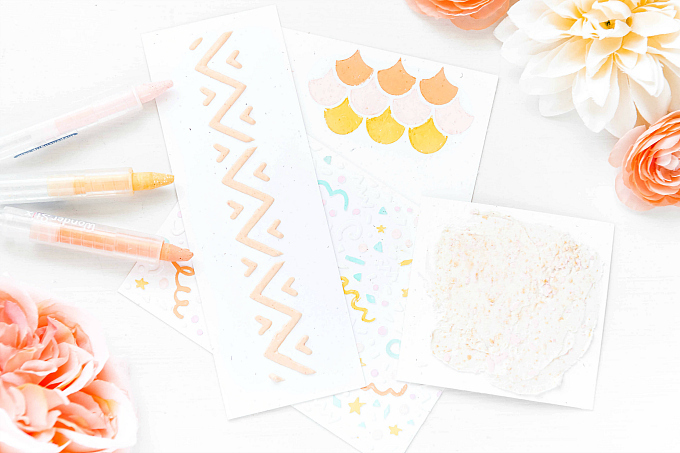 I found your work on scrapbook.com, and love your cheerful designs and colors. Waving a big hello! Thank you for stopping by and for the sweetness! I'd love to check out your work if you're on SB! Just let me know your gallery's name :) Hugs!